You may be wondering why I’m writing about Imbalie Beauty. We’re not in the business of “Advanced Fluorescent Technology”, but I wanted to show Imbalie Beauty how powerful SEO marketing can be. I’m always up for a digital marketing challenge and I love showing clients how to harness the power of the internet, so I accepted the challenge of trying to get this post to page one on Google.co.za for the phrase “Advanced fluorescent Technology Gauteng”. Advanced fluorescent technology is a pain-free hair removal treatment. Thanks to the patented IN-Motion technology, clients can even treat sensitive areas without the discomfort of other systems. By using a sweeping, paintbrush technique, the procedure is shorter, more comfortable and clients will see results with fewer visits than ever before. How advanced fluorescent technology works? Using carefully controlled pulses of light, the Diode Laser System’s proprietary IN-Motion technology selectively and gradually heats the hair follicles within the dermal layer of the skin. The heat is limited to just the area of follicle and eventually damages the cells that would otherwise reproduce new hair. The surrounding tissue remains healthy. This technology is also used during skin treatments and can be used to improve dull complexions, uneven pigmentation and large pores, as well as red flushing skin and rosacea. When you book an advanced fluorescent technology (AFT) skin treatment, the light is applied in a series of gentle pulses over the treatment area. Without damaging the skin, the light penetrates the sub-surface skin layers and is absorbed by the blood vessels’ or by pigmentation. The heat impairs the vessel or lesion and the body begins its natural healing process. 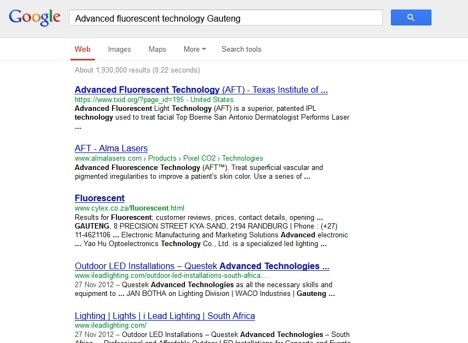 If you Google “Advanced fluorescent technology Gauteng” you get this result as of the time of writing this post (14 December 2012). What I am hoping for is that after publishing this post, I will be able to get a page one position for the “Advanced fluorescent technology” keyword that we are targeting. Let’s see what happens.